My dream had come true, I was employed Friday and Saturday nights to work behind the counter at the Pokerino Palace. The manager hired me in spite of being underage, as I was very bright. This was another way of saying that I would be paid below the legal minimum wage. Things went along without incident the first two weeks and then disaster struck on the third Friday. A heavy set woman was playing and one of her balls got stuck between two others. The rule, as posted was that the ball was to be returned to the player. I was told by the woman to place the ball in an Ace hole which would give her three aces and a winning hand. I pointed to the rule and returned the ball to her. She stood up, threatened me with a bad beating and left. Another worker in the Palace told me that the woman was Tony Galento's wife and that I was in deep trouble. 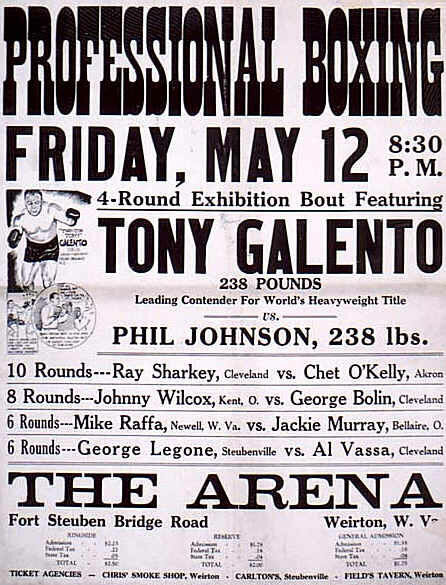 Tony Galento was better known as Two Ton Tony because of his squat build with a large stomach. 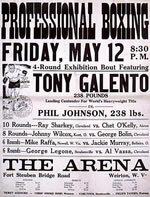 Tony was a heavyweight boxing contender and was scheduled to fight Joe Louis in a few weeks for the heavyweight title. A few minutes later the woman returned with Tony, pointed to me and said, "That's the one, Tony." Two Ton came rushing at me uttering curses and saying he was going to kill me. I took off for the back door with Tony in hot pursuit. I was able to go right out the back door, but Tony had to get over the counter I was behind. He made a good jump for a man his size and shape but luckily for me his toes caught on the counter and he went down on his face. While running across the park I would glance back and could see that I was easily outrunning my pursuer. I found a good hiding spot behind a trash can next to a custard stand. Two Ton never found me. About fifteen minutes later I returned to the Palace and learned that I no longer had a job. The manager explained that if either Mr. or Mrs. Two Ton came back and saw me there Tony would take the place apart. A few weeks later the big fight took place and I was among the millions of radio listeners. Needless to remark I rooted for Joe Louis. Each punch Joe landed was for me. The fight was stopped with Louis being the winner by a TKO. I couldn't have been happier. In later years Two Ton became a wrestler, had an act in which he wrestled an octopus and ended his career owning a bar in Orange, N.J. Many times I passed his bar and often thought of stopping in. I never did though as one thought always hit me, Suppose he's still angry?